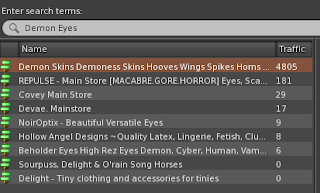 This week on Tutorial Thursdays I took a suggestion from a fellow blogger, Deoridhe Quandry, on showcasing how I freebie hunt and then organize the results. Now, this will be part tutorial, part guide of sorts, as there are many ways to do this, and a lot of resources out there for people doing the exact same thing. I have been blogging on Free*Style for over 7 years now. 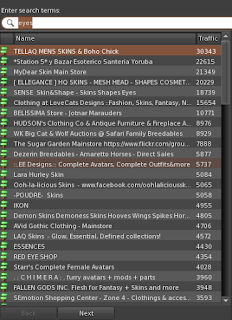 I didn't start out as a blogger here, but as a inworld freebie finder for the Free*Style group, when we still had one. I eventually was brought on as a Guest Designer Blogger, and now actually Co-Own the blog, along side Sileny Noel. Free*Style was my first introduction to Blogging. 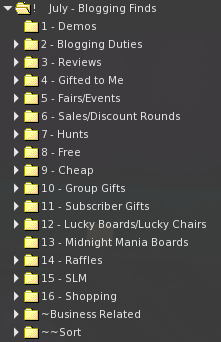 So right off the get go, most of my folders in my inventory became related to Freebies. The way I started, in the beginning, for posts, was to do them by theme. I would go off one word, and try to find a whole bunch of stuff, then figure out if I could make it work. It would be something like zombie, duck, orange, water, you get the idea. This made my posts more interesting and different. Everyone has their own style, but sometimes there is only so much you can do with a single item. Seeing said item 20 times in one week can get annoying, if you are a reader that follows many blogs and feeds. I have always tried to stay away from this. I will even blog things months later, on purpose, if they are still out. Free*Style has never been about blogging all the things first, but more of a supportive blog, to our group of designers, as well as a group of fun bloggers. We strive to bring you guys a bit of joy, and silliness, when we can. So how do I start my freebie gathering? It is actually a bit of a process, depending on what I am planning on doing. The easiest thing to explain would be my month long setups. I start gathering each month on the 5th. This is due to me also being a designer. Chances are I have events at the first of the month, or around there. After things get set up, I have the time until mid-month to play a little. The 5th is also a good start point due to Group Gift change overs, they often happen between the 5th and the 10th. I try not to get into the habit of blogging too many group gifts, as to me, that seems like lazy blogging, for a freebie blogger. I also like to have my outfits on Free*Style mostly free, so I basically need to find everything, from head to toe(if I am showing my feet, which more often than not, I don't). So I prepare my Folder for the month. I don't only blog here, I also blog on some other sites. I started my own blog, Pixel Mythos, at the start of the year. I have been Guest Blogging on It's only Fashion since 2013. I also blog under multiple avatars, and some of them have blogs too. So my folders are set up not just for freebie blogging, but for all my blogging/personal needs. The system is fairly self explanatory, so I wont really go into detail too much on it. If I find something needs to be added, I will throw in a new folder. If I am busy on a given day, things get shoved into the Sort folder, and I get to them when I can. Next would be the actual Finding. Chances are, I will already have an item I want to focus on, or have seen something I like somewhere. That first thing catapults the whole start of the Finding. It might sound weird, but the first thing I do is go to Inworld Search. So say I want to look for eyes. As you can see to the left, typing in just eyes will bring up all sorts of things. Sometimes I like to go to the bottom of the list, and work backwards. This is how I tend to find new shops I have never heard of. Typing in something more specific will bring you better results. You might not always find a freebie, or what you were looking for, but you will find something. That is part of the journey. Try different combinations when doing your search. After maybe an hour of doing Inworld Search, I will go to my Inworld Groups. I normally don't keep notecards, I close everything, unless it seems like a limited time sort of thing. So on my Finding days, I will go through all my groups, and collect anything of interest, as well as group gifts. I use to talk in these groups a lot, not so much anymore, but the ladies are always wonderful when I am trying to lock a MM board, or need help finding something. Just follow the group rules, write things in an appropriate manner when talking to the group on whole(so they don't think you are spamming) and you will be fine. I use to also be a part of some asian and brazillian freebie groups, but I can't remember the names of them now. There are so many other groups, so try doing a search in the groups section of the Inworld Search. After going through all my Inworld Groups, I normally turn to the Internet to further my looking. Seems silly reading that, doesn't it? You would think this is a logical choice. There are many Internet resources, that you might not know about. These are just the ones I use, I am aware there are many more. I go to the Images search, I normally just type in "Second Life Free" or "Second Life Gift" or some combination, until I see what I like. I hit the Search Tools, then Time, and hit Past Week. This will sometimes show things that are old, but in most cases, the items will be recent. Google does like to autosource from sites you already visit, most of the time, but it will bring up some different stuff too. From here you just click the picture you like, then click the Visit Page, from there, you should be able to find out the information for the freebie. Flickr is one of my favorite things in my whole digital world. Here you get to have glimpses of other peoples imaginations. Or get to go on journeys, and see how others view their own Second Lives. Much like Inworld Groups, there are many Flickr groups catering to Freebies. What's in your lucky chair??? Some of these group are not moderated, so they can be rather annoying to sort through. Pinterest isn't something I used until the last few years. It took making my own board to really get me into the use of it. And that is it for me, for pinterest, haha. It is my least used resource, so far. Normally the last thing I check. I am sure there are other wonderful boards for freebies, I just haven't had the need to explore my options here. I use Scoopit a lot. Again, while I use this a lot, I have never really explored for other sites, I just use these 2. There are a few Freebie Feeds. Yet again, there are more, but these are the ones i got to the most. Zomg, there are soooooo many awesome freebie blogs out there. This one has free mixed in with the full priced outfits. Sometimes there are full free outfits features done. This is a NSFW(Not Safe For Work) blog. At this point, if you don't already have another 2k of inventory, I'm not sure what to tell you, and I obviously fail as a teacher, haha. We haven't even gotten into finding hunts yet, or great places for lucky boards, or any other number of the other ways to get awesome stuff, like freebie hubs. 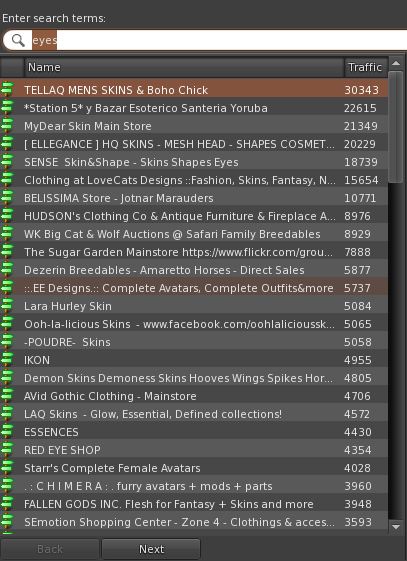 Nor Events, Sales Rounds, SL Marketplace. I think I will leave that for another day, and let you enjoy sorting through your treasures for now.